Online ordering menu for The Bagel Shop . Our “New York Style” Bagels are packed full with flavor and are aimed to please. Our Bagels have a crunchy exterior with a warm doughy inside and they are large in size. Any one of our fifteen varieties will leave you wanting more. All of our cream cheeses are made in-house. We’ve taken the time to perfect our recipes so that every bite is packed with a mouthful of freshness & flavor. We even have the best breakfast and lunch sandwiches! 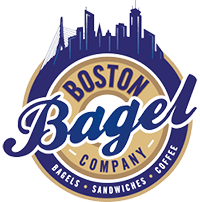 At Boston Bagel Company, we offer an artisan deli meat that is all natural without any artificial flavors, fillers or ingredients. Its a deli meat with full rich flavor that tastes better and is better for you. Our turkey and ham is sourced from local family farms and contain no antibiotics and no growth hormones. Place your online order today for a quick and easy carryout experience! We are located at 3 Oak St, just 5 mins from Endicott College.